The rural county of Fenghuang can be roughly split into two districts: New Town and Old Town. While the new town is simply a residential area, the old town is something altogether more enchanting. 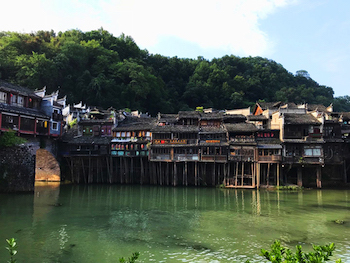 Fenghuang Ancient Town was officially established during the Qing Dynasty (1644-1912), but its history can be traced back as far as the Spring and Autumn Period (c. 771-476 B.C.). Rising at the base of misty mountains and facing the rippling Tuo River, its location is known for its excellent feng shui 1. The name “Fenghuang” literally translates to mean “Phoenix”, which in Chinese tradition is associated with good fortune and longevity. According to local legend, the town is so-named because, one day, two phoenixes were flying overhead when they paused to admire the town’s beauty and were reluctant to leave. If it’s enough to catch the attention of a mythical creature, it must be one magical place! 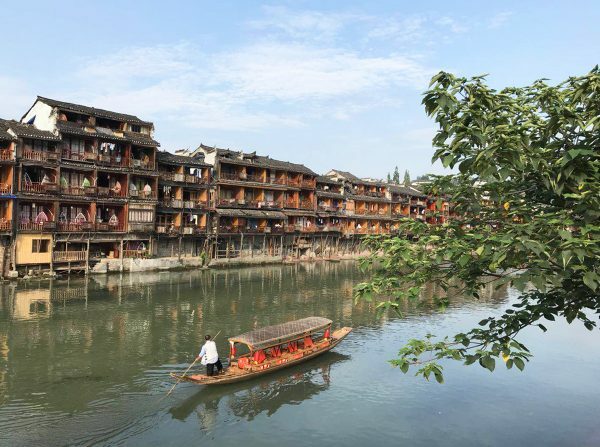 For over 300 years, the ancient streets, alleyways, and houses of Fenghuang have been exquisitely preserved. Its most unique feature is undoubtedly its wooden diaojiaolou 2, which perch delicately over the river. The incorporation of the river into the town’s layout demonstrates how important it is to the villagers to live in harmony with nature. It is not uncommon to see women washing clothes or men casting their fishing nets into its expanse, much like they have done for centuries. Boatmen wait by the banks, offering visitors the chance to enjoy a scenic cruise up and down the river. The diaojiaolou are also the first hint towards the town’s multi-ethnicity. 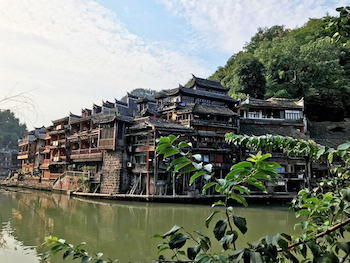 Unlike other cities and towns in China, which are predominantly populated by the Han Chinese ethnic group, the vast majority of Fenghuang’s population is made up of Miao and Tujia people. Miao traditions, architecture, and culture dominate the town, from their elegant traditional dress to their intricate handicrafts. Shimmering silver jewellery, vibrant batik 3 cloth, homemade tie-dye clothes, and numerous other local specialities are sold in Fenghuang’s local shops. Yet the Miao weren’t always the peaceful villagers that you see today! Fenghuang was once the centre of numerous Miao rebellions, which were so fierce that it prompted the Ming Dynasty (1368-1644) to build the Southern Great Wall. This wall still stands on the outskirts of the town, and is now a popular tourist attraction. Other local attractions of note include: Huang Si Qiao Castle, one of the most well-preserved castles from the Tang Dynasty (618-907); Longevity Palace; Chao Yang Palace; and the Heavenly King Temple. The former residence and tomb of the renowned Chinese writer Shen Congwen is arguably the most popular site in the town. In fact, his novel The Border Town, a romance written in 1934 and set in Fenghuang County, is believed to be what catapulted Fenghuang Ancient Town to national fame. It appears that Fenghuang’s residents were truly blessed with good fortune, as it was also the hometown of Xiong Xiling, who was once the premier (1913-1914) of the Republic of China (1912-1949) , and Huang Yongyu, a celebrated painter in the traditional Chinese style. The playful bubbling of the river; the feel of flagstone steps worn smooth by thousands of feet; the sweet smell of freshly cooked food, dotted with locally grown chillies as red as rubies; these are the simple pleasures that this picturesque town has to offer. Surrounded by primeval forests and flanked by shadowy mountains, it is a place lost in time and resplendent in its timelessness. 1. Feng Shui: This theory is based on the premise that the specific placement of certain buildings or objects will bring good luck. 2. Diaojiaolou: These are two-storey wooden dwellings that are suspended on stilts, with the ground floor being used for storage and the upper floors being used as living spaces. 3. Batik: A cloth-dying process whereby a knife that has been dipped in hot wax is used to draw a pattern onto the cloth. The cloth is then boiled in dye, which melts the wax. Once the wax has melted off, the cloth is removed from the boiling dye. The rest of the cloth will be coloured by the dye but the pattern under the wax will have remained the original colour of the cloth.